A horizontal through hole mount is commonly used as a holder or platform that is used to mount toroids on their side. The most frequently used mounting molding material is plastic. Molded pieces are made to the specs of the size, termination points, and shape desired. They are usually made as a cup-like shape or a platform. Both molding types include standoffs that allow easy cleaning solutions between the PCB and components. In most cases, the minimum standoff is close to 0.015 inches. Leads from winding get attached to the mount’s terminals through the process of soldering. Self-leaded is possible if the wire is stiff and large enough. It can even be positioned through a header or mount that goes into the PCB. After attaching the toroid to the mount, the component is finally ready for the printed circuit board. Because magnetic components are large, extra measures must be taken to ensure electrical integrity. A PC, with un-plated through holes that uses heavy components may also need a clinched terminal. Boards with a printed through hole offer the user strong mechanical integrity without clinching. They can provide strong intermetallic bonds that are created during the soldering of the board. Attaching toroids to mounts with mechanical or adhesive means is possible. Horizontal mounting offers low profiles and low center of gravity for applications that experience frequent vibrations and shocks. Large diameters on a toroid make horizontal mounting take up too much circuit board space. Vertical mounting can be used in situations like this. 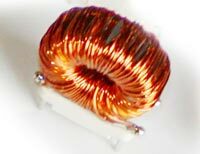 For more information on transformer coil winding, give us a call today.